6. If it can’t be said simply, don’t say it. I read the essay in the spring of 1989 when I spent much time at sea with Richard Garvine. Rich was my PhD advisor and he probably suggested this essay to me, his German graduate student with poor writing skills. Rich taught me both science and writing. I miss him. 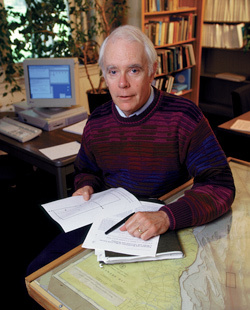 Richard Garvine in his office at the University of Delaware in the 1990ies. This entry was posted in Uncategorized and tagged George Orwell, NASA, Richard Garvine, writing. Bookmark the permalink. But to return to the subject at hand, as I see it, in one respect you are correct to point others towards the use of some rules of writing; “as part of large science teams …..” However, I also suspect that those of you that have worked so hard for so long to gain some understanding of the processes under way within the Arctic and Antarctic; are also having to come to terms with the even greater responsibility of widening the debate to the rest of the planet. Perhaps the best rule there will be to be to remember that people respect total honesty.